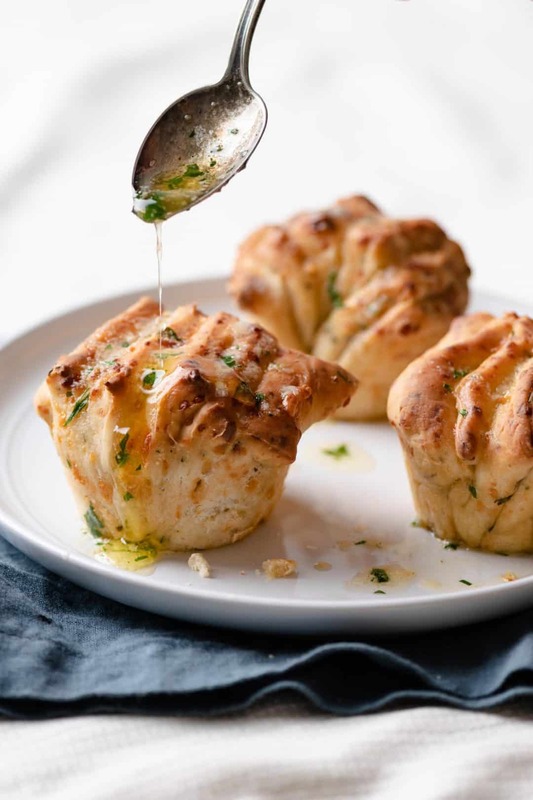 When Beer Bread and Cheese combine to make a fun zingy muffin, what’s not to love?! I mean we all like a cold beer with a slice of pizza right? 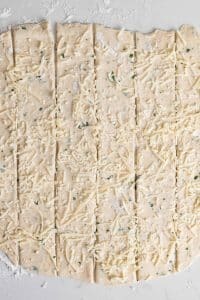 This recipe was inspired by Bake From Scratch magazine’s Parmesan-Gouda Fantails, originally created by Marian Cooper Cairns. I made a few adjustments using parmesan and asiago cheeses with garlic powder. 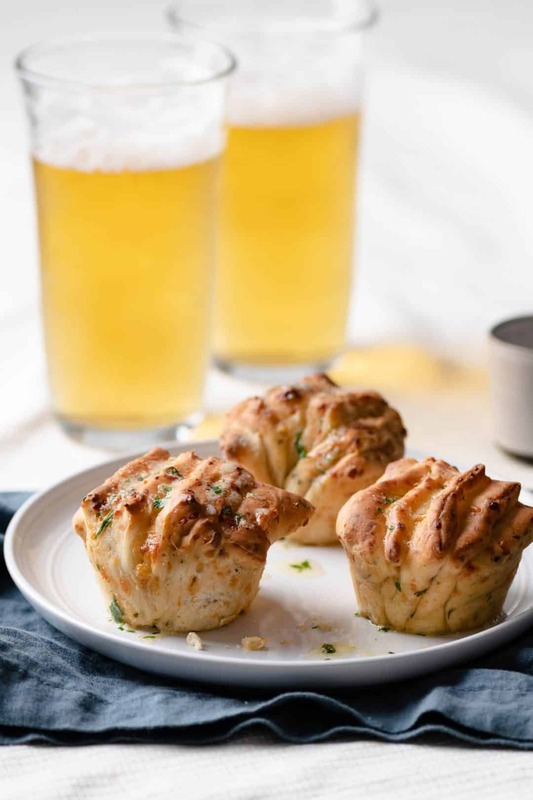 For these Beer Bread Muffins I used a Pilsner Beer to enhance the overall flavors. Fresh Parsley and Garlic Powder for a balanced nutty flavor. 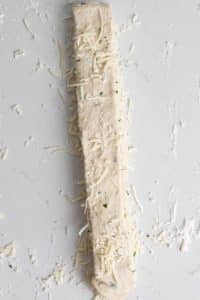 Parmesan pairs nicely with asiago for cheese breads, creating an overall pizza like experience. 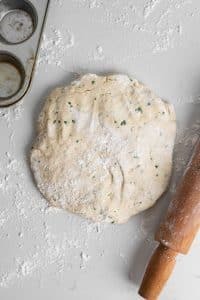 These are almost like having garlic cheese knots, but with a softer texture. What is a Pilsner? Why Are You Baking Bread With Beer? Pilsner is a lager beer with a strong hop flavor. 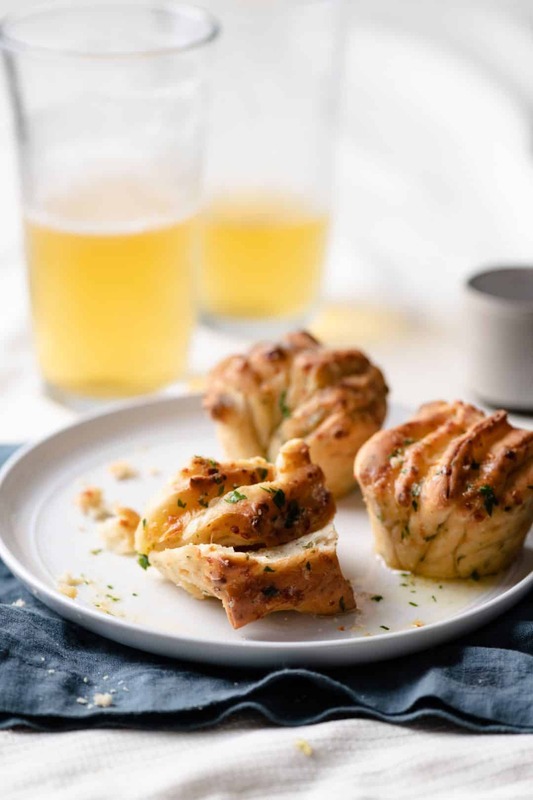 Beer amplifies the toasty flavor of savory breads and adds moisture, and creates a more delicate crumb. Due to its natural leavening agents, beer can shorten the proof time in yeast breads. Try making these muffins for a weekend brunch or afternoon snack! 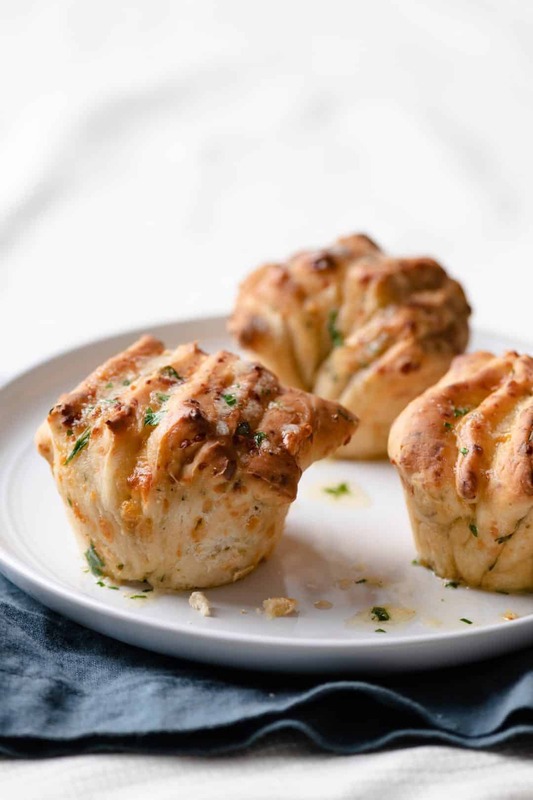 These cheesy buttery muffins pair well with salad and pasta! 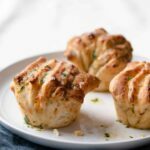 Parmesan Beer Bread Muffins made with pilsner, parmesan, mozzarella, parsley, and garlic in a fun fantail shape. Flavorful savory bread recipe! Pour ¼ cup (60 g) of beer into a microwave safe bowl for 10 seconds. Temp should be between 105F/40C to 110F/43C, any warmer and it will kill the active yeast. Mix in sugar and yeast, stirring gently with a wooden spoon. Let sit for 5-10 minutes until foamy. Add melted butter and remaining ¾ cup (180 g) of beer. Gently stir to combine. 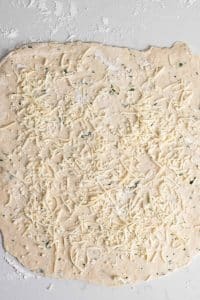 Using bowl of stand mixer with paddle attachment, work 2 cups (250 g) of the flour, Parmesan, garlic, parsley, and salt together at medium speed. Pour in yeast mixture slowly, continuing at medium speed. Dough should start to form and grip the paddle attachment. Slowly spoon in remaining flour until dough begins to pull away from the sides of the bowl. Place dough in a lightly oiled bowl, cover with plastic wrap, and set in a warm draft free place to proof, about 45 min. Prepare a 12-cup muffin pan with baking spray. Place dough on a lightly floured surface. Punch down excess air. Roll first half into a 12 in by 12 in square. 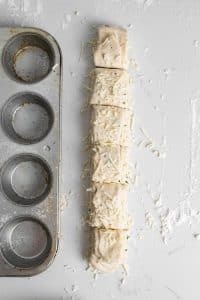 Sprinkle with ¼ cup (30 g) Asiago cheese and gently press with fingertips into the dough. Using a bench scraper or sharp knife cut into 6 even strips. Stack the strips evenly onto one another. Then, cut short length into 6 equal pieces. 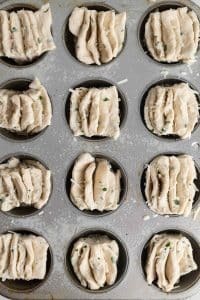 Place each piece sideways into the center of the muffin tray cups. Gently separate the top half of the layers to create a fantail. Loosely cover the muffin tray with plastic wrap and set in a warm draft free place to puff for a second proof. This should take an additional 40-45 min. Bake muffins until golden brown about 20-24 min. Set muffin tray on cooling rack for 10 minutes before removing each muffin. Meanwhile in a small saucepan, add remaining 2 Tbsp of butter, teaspoon of garlic, and 2 Tbsp of Parsley. On medium low heat, allow butter to melt and cook down parsley. Drizzle warm butter mixture onto muffins. 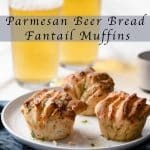 Pour an ice cold beer and enjoy your hard work with a delish Beer Bread Fantail Muffin!